“Oh my GOD,” they said. Then it would begin again: the groans, the nods of pained understanding, the airing of grievances. The fearsome 2016 wildfires of the Smoky Mountains had only just subsided, and the town was still reeling from the fact that for all the emergency evacuation messages, only caring neighbors and the acrid smell of a burning forest had alerted most country people to the danger. The county had just sort of assumed electronic alerts were enough. Road construction in Cocke County, TN. Photo by Lou Murrey. The Internet is hard to imagine as a physical presence. It seems, sometimes, to fly through the air, float in clouds, and drop itself into our laptops like a blessing from above, as though paying the cable bill is like praying to a fickle and choosy god. Comcast and other cable companies may be fickle and choosy, but they are certainly not gods. 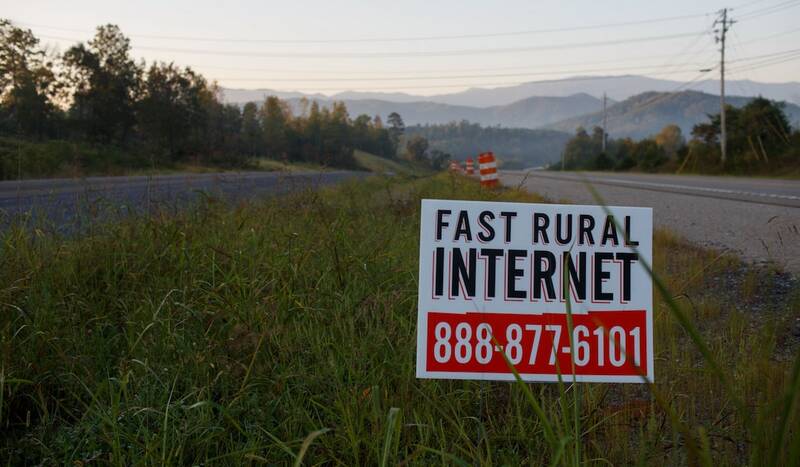 As rural East Tennesseans know all too well, Internet is not magic. It is critical infrastructure, and once again, the Appalachian South has been left behind. As the economy struggles, residents, many of whom trace their families seven or eight generations back, are forced to choose between living here with their families, without adequate services or employment, or packing up to search for a better life elsewhere. The stakes of this choice are high—for individuals, for entire communities, and for East Tennessee itself. Like much of Central Appalachia, East Tennessee is losing people—not for a lack of love, but out of the gnawing, persistent certainty that to stay is to consign oneself to a lifetime of hardship. Though broadband access is only one string of many that pull on local people, it is twisted up with all the others. Following its path can help detangle the complex economic stresses on the region. I spent three months interviewing residents of rural East Tennessee, a geographically rugged mountain region that is broadly considered to exist within the larger region of Central Appalachia. Like the rest of Appalachia, East Tennessee is known for physical beauty, resource richness, and unusually high levels of low-income and unemployed people. Because of its poverty, Appalachia is well-publicized as an object of pity and charity; less known are the voices of its people. They are hardly ever asked, even by journalists “What do you want?” or “What do you need?” These questions, simple as they are, open up conversations about the frustrations of cash-poor East Tennesseans, exposing hard truths about this place and the people who must choose between home and elsewhere. In Tennessee’s hollers, towns, and underfunded small cities, broadband access can make a big difference for those wondering whether they can stay in their rural home. Here, broadband means more than just the Internet in general—it means speed and connection in a region that is often presumed to be slow and isolated. Definitions of broadband vary, but most settle on 25 Mbps download speed and 3Mbps upload. These speeds enable multiple Internet users per household, easy streaming, and quick page load speeds—all of which are essential for online entertainment, education, and employment. Most often, broadband is delivered over fiber optic cables, which are the most cost-effective option due to infrastructural longevity and, unlike satellite, are generally reliable regardless of weather. Broadband is typically distributed through private means—that is, by the telecommunications industry. Lines, towers, and satellites are expensive, which allows mega-telecoms AT&T and Comcast to have a virtual duopoly over much of Tennessee. But broadband infrastructure is more difficult to build and maintain in mountainous regions, and telecom prices are beyond the reach of many East Tennesseans. Satellite services target rural residents specifically, advertising themselves as more affordable options. However, they tend to be unreliable, with residents describing interrupted service during storms and even cloudy days. The fearsome 2016 wildfires of the Smoky Mountains had only just subsided, and the town was still reeling from the fact that for all the emergency evacuation messages, only caring neighbors and the acrid smell of a burning forest had alerted most country people to the danger. The county had just sort of assumed electronic alerts were enough. All of this means that broadband remains a luxury for cash-poor East Tennesseans. The price is high, service is unreliable even when it is available, and the private telecoms have little accountability to rural residents. But luxuries quickly become necessities. Before the New Deal era, electricity was widely seen as an expensive urban extravagance. Today, electricity saves lives. In the mid-20th century, the under-electrified South, ever the perceived problem child of the United States, became a focus of rural development and modernization efforts. The New Deal created the Tennessee Valley Authority, a public-private hybrid agency intended to electrify rural areas. The reaction was mixed; some benefited almost instantaneously, but many of the poorest Tennesseans were evicted from their land to make way for dams and nuclear facilities. The towns of Butler, Loyston, and parts of Rocky Top: their schools, steeples, and graveyards sit below the water, casualties of grand modernization projects. But in the span of a decade, Tennessee was electrified from end to end. Today, broadband Internet is in a similar position. Just as electricity once was, Internet is taken for granted by middle- and upper-class people living in cities, seamlessly interwoven into daily life. Job applications are mostly online. Remote schooling? Online. Social life? Online. Affordable Care Act registration? Online. But much of this is out of reach for many people in rural areas. According to a 2016 state-funded study, 34 percent of Tennesseans, most of whom are rural, lack access to reliable Internet service. But even this figure might significantly undercount residents without Internet access because, ironically, the study was distributed to respondents online. Some believe that the free market will naturally fill this digital divide over time, bringing rural areas up to speed with the rest of the country. Others believe that the market is failing to do its job, and that a municipal, public approach would benefit the greatest number of people. They claim that private entities will never properly serve areas where people are few, poor, and geographically far between, because those areas cannot generate sufficient profit. Thus, they view publicly-owned broadband as the next big leap in closing the digital divide. And in fact, in some parts of the region—Pulaski, Morristown, Jackson, Erwin, Bristol, and most famously, Chattanooga—public utilities do own and distribute high-speed Internet service, for roughly half the price of a private telecom. Nonetheless, with much at stake on both sides, the private versus public provider debate has energized activists, public sector employees at all levels, and businesses. Cocke County, TN at dawn. Photo by Lou Murrey. In our conversation at the Pigeon River Smokehouse, Manzanita seemed keen to mention that tourists and retirees who recently moved into the area have more access to services than she ever had with her trailer atop a high mountain, buffeted by wind and storm. In rural development projects, affected people often are left in the dark, believing that it is their own failings—rather than the failure of public services—that have left them in marginalized positions. With 15 million visitors annually and only five exits off the interstate, influx is overwhelming capacity in Hartford, and Manzanita grumbled that it was honestly too much. Few local politicians have looked beyond immediate tourism-centered growth, but the Newport Utilities Board aims to change that, by bringing job-focused infrastructure to the area. An extension of Cocke County public utilities, the Newport Utilities Board (NUB) has developed plans to lay fiber optic cable throughout its service area. Funded by a grant from the United States Department of Agriculture, NUB plans to use high-speed communications development to invite long-term, middle-class jobs into the area, while retaining intelligent young people who would otherwise leave for larger Southern cities. NUB is keeping the project fairly low-key. According to employee John Knight, Cocke County is for once “ahead of the game,” and Knight is not ready to attract the attention of AT&T’s dedicated lobbyists. NUB views broadband, along with other infrastructure developments, as prerequisites for a diversified and stable local economy. Infrastructural projects often founder on a catch-22: No infrastructure can be built without investment, but investment depends upon tourism revenue, and sufficient tourism revenue requires infrastructure. With public funding from the USDA, NUB is poised to break apart this vicious circle. And yet, even the barest efforts to bring broadband to Cocke County have been met by powerful opposition. An anonymous but well-funded mail campaign rang alarms about mishandled tax money in order to sway residents against the project, even though NUB is actually utilizing business partnerships along with USDA grant funding. This worked somewhat, mostly because NUB has not done much to gain local trust. People on the street often did not even know about the broadband project at all. I was offered another perspective at Elizabethton Public Library, the only public library in Carter County. This mountainous county in Northeast Tennessee adjoins Johnson City, and many of its residents commute there for work. However, the tax base and services in the city don’t expand outward, and Carter County remains significantly poorer, with only a 24 percent voting rate. The library, which librarian Mary Anne Owen calls “a sort of community center,” offers clubs and social activities, educational childcare, GED training, ESL, and of course, access to public computers. But public libraries often lack the funding they need to do their best work. We sat in the library towards the end of a late autumn day, as shadows fell across the big smiling cardboard cutout of Dolly Parton in the children’s section. Across the room, a number of couches and comfy chairs were arranged around newspaper racks; near the front desk, 11 computers sat humming and dark. These computers are the only point of public Internet access in the county. The library serves everyone: city people, country people, the often-unseen rural homeless and couch surfing population, recently released felons hoping to restart their lives or seek food assistance. Some drive from remote towns like Roan Mountain, an hour away, where even running water and electricity can be inconsistent at best. The community computer lab at the Newport Public Library in Newport, TN. Photo by Lou Murrey. “Would you leave, then?” I asked. But Mary Anne loves her home fiercely, telling me as we stayed past closing hours that she believes there is immense untapped capability for good in her community. “We have to start standing up,” she said, firmly. Amanda sat next to her in the booth. She was a manager too, around Doris's age, with light graying hair, and was mostly in quiet agreement. “I’m going to Chattanooga,” she said, “for better schools, and to be near my family.” Incidentally, there’s also high-speed broadband to be found there. As their shifts approached, both rose and thanked me; Doris watched a young waitress slip through the restaurant with a hamburger on her tray. “Many of our servers here are young mothers,” said Doris, “and they’re stuck.” She shook her head. “If young people can leave, they should.” The waitress laid the hamburger on a customer’s table, and walked away, her prematurely furrowed brow belying her work-ready smile. Some grassroots organizations in the region are unconvinced that private providers will close the digital divide, and are working toward “reliable, affordable, publicly-owned and accountable broadband.” Sustainable and Equitable Agricultural Development, or SEAD, uses this slogan to educate and organize for expanded rural broadband. SEAD initially worked on land-based issues, and its members remain committed to supporting local farming, arts, culture, and community leadership. But it began to prioritize broadband when it realized that few of these objectives are feasible in 2017 without reliable Internet in local communities. Members from rural Cocke County, as well as Claiborne and Jefferson County, started making demands on county commissions, city councils, and officials in Nashville, the state capital. They discovered that despite some ideological differences, county officials understood the importance of rural broadband better than public servants in Nashville. They formed alliances at the county level, joining together to educate and pressure state representatives. Organizers understand that if existing laws and power structures remain in place, a patchwork of solutions would be necessary to connect rural Tennessee to affordable service. Beyond this, SEAD’s members also envision solutions that grow cooperative ownership of resources, without involving the state at all. In this vein, the organization has begun to partner with HollerNet, a small-scale private wireless ISP. Once more coming together across ideological differences to do mutually necessary work, this partnership aims to connect small communities in Cocke County and Jefferson County to HollerNet servers. HollerNet has no explicitly defined politics beyond turning a profit, but its owners are eager to spread their technology at a lower cost, and to combine their business with user education for needier areas. In this way, unlikely—and often uneasy—alliances between community groups, private entities, and public entities are shaping rural areas, as the rocky process of building community power continues. The state legislature is moving forward with its work too, albeit slowly. In 2017, during his annual State of the State address, Governor Bill Haslam announced a new project. The Tennessee Broadband Accessibility Act will provide $45 million in grants over three years to local broadband projects. The act will make funding available to local libraries for computer literacy education. It will also re-open broadband distribution capability to Tennessee’s electric cooperatives, which will now be able to distribute Internet service. However, before it was allowed to pass, the Broadband Accessibility Act received addenda by legislators which provide a $15 million tax credit to private service providers—the very same service providers that currently charge exorbitantly high prices in rural areas. This add-on minimizes the potential of the act to reduce the profit motive and keep broadband affordable for working and poor people. It also makes transparent the ways that privatization, and the public sector allies of private telecoms, have stymied rural broadband access all along. A mural of the Smokies on the side of an abandoned building near Cosby, TN. Photo by Lou Murrey. In East Tennessee, the economic tapestry holding rural communities together is frayed. Residents are caught between love of their home and the economic currents pulling them away from it. The digital divide is just one factor of this tension. It is both a symptom and an aggravating factor of economic inequality, born from years of neoliberal privatization and a deeply uneven balance between resource extraction and investment. As communities fracture, young people especially feel that to maintain their community ties, they must give up the future, or vice versa. Whether they come to the Pigeon River Smokehouse for barbecue sandwiches or go to the Elizabethton Public Library to fill out their job applications, work in Applebee’s to make ends meet or delay college to take care of a sick parent, they embody no less potential than those with more resources. But to realize that potential, they need resources. For those who can stay, the path forward lies, perhaps, in building resilience, community, and capacity. But there is one path to those aims, because socially, geographically, economically, and infrastructurally, no two rural communities are exactly alike. Mountain to mountain and valley to valley, they vary. SEAD organizers understand that if existing laws and power structures remain in place, a patchwork of solutions would be necessary to connect rural Tennessee to affordable service. Whether community organizations push for legislative action or take steps forward themselves, and wherever they find allies, the work is to build, connect, and grow, the use of broadband as a springboard for dreaming of a kinder and easier Appalachia. Katie Myers is an educator, organizer, journalist, and playwright in Knoxville, Tennessee. She currently splits her time between an after-school theatre program at Inskip Elementary School and East Tennessee PBS, where she coordinates research assistance for a documentary series on Black life in Appalachia. In today's America, every season is bloody and Black death is the norm. Aiken challenges the stereotyped image of a "progressive" New England in this essay. When the normal operations of power sanction violence, what does it mean to mourn?